New to the forum. 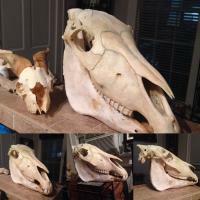 I'm a contemporary artist with a research based interest in Archaeology, fossils, geology, and the sort. Thought I'd introduce myself with a couple of recent finds I found pretty exciting. 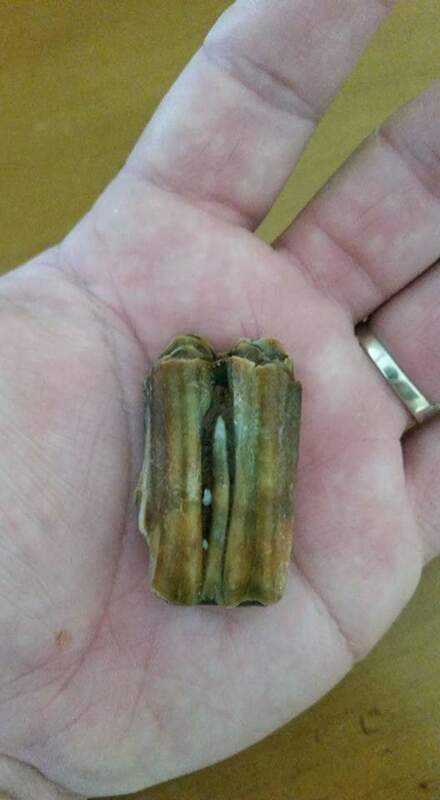 What really got my attention was this fossilized Bison tooth. I'm not sure how old, but judging from the petrification I'd say it's very old. There's also signs of a stylid, so I'm thinking M2 or M3 Bison tooth. 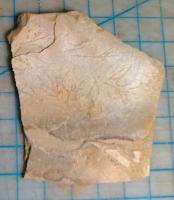 I also cracked open a stone slab and found the faint plant impressions. I thought those were pretty beautiful. On the top left there's what appears to be a worked stone, possibly involved in arrow head making? Nice too meet you guys. Welcome to the forum from Austin. The tooth is nice. Others will chime in here and will probably point out that teeth can get pretty old looking in a short time in our creeks and age can be hard to determine. 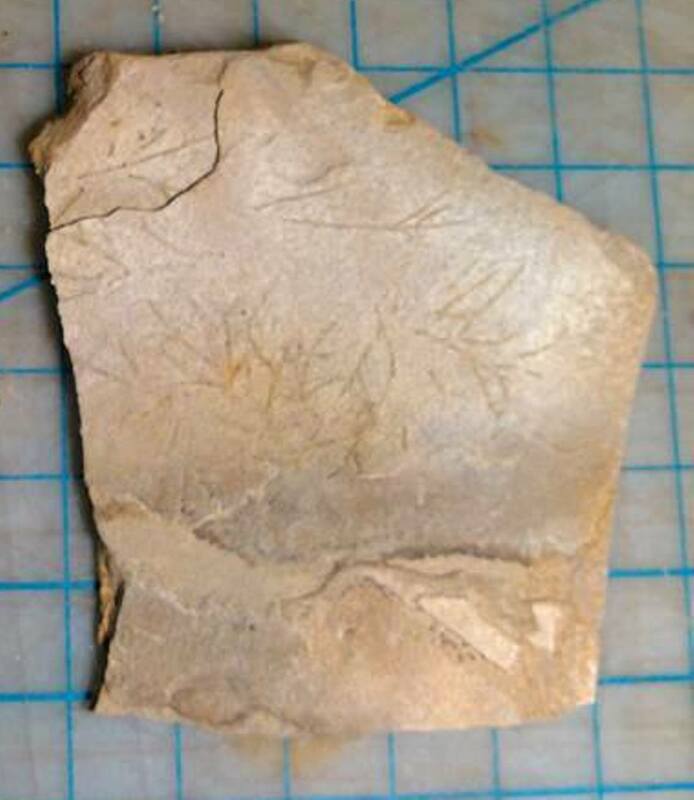 Th plant-like things are interesting but probably trace fossils not plants. The scallop is probably the bivalve Neithea. 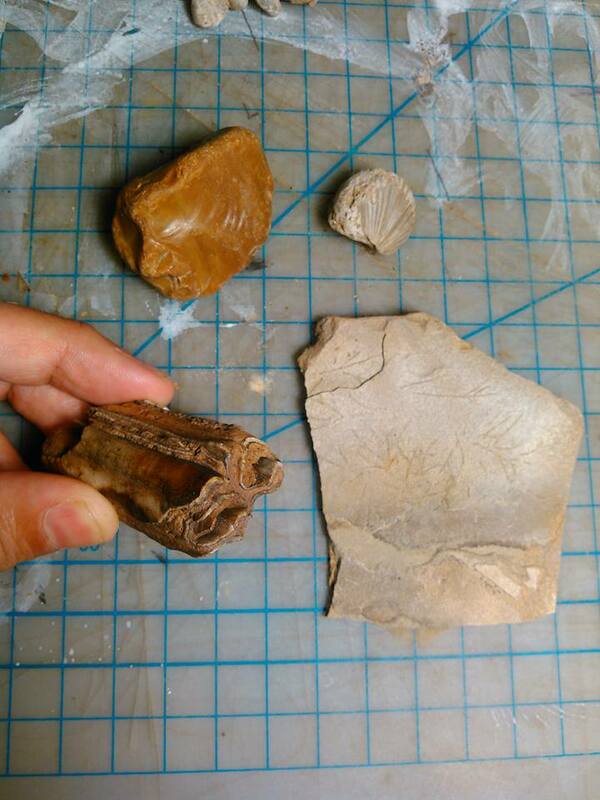 The red flint would require a closer look by someone who knows what to look to determine if it is a "worked" piece. 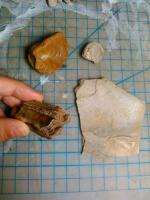 There is oodles of chert in our local rocks and many pieces are just tumbled naturally broken bits. After years of collecting fossils and only finding tools for the first time recently I still am not sure what was worked and what is just a naturally broken piece of chert. Thanks erose. Very cool. I tried looking up what the trace fossil might've been but no luck. I figured the tooth could be from any point in time, it definitely feels more like rock than tooth by now. These marks could be traces of "worm" tracks, but they are somewhat discontinuous, making that less likely. They could be fossil impressions of vegetable matter, or they could be more recent marks left by roots growing between the shale layers. Do we know whether the rock is marine or fresh water deposited? Perhaps they are worm tracks, I'm not familiar with how worms travel, but they seem to stem out from central stems outward. A bit like fractals. It was found in a fresh water creek. If the marks are connected, then worm tracks could be more likely. When and how the sediment was laid down before becoming rock is what would be important. In the Austin area, that would likely have been during the Cretaceous, in the shallow inland sea. I see a lot of this sort of thing, and i am going to with traces left by modern roots. Of course, it would be cool if i were wrong. We found this in a friends field in his ditch.. But we have another skull to get but it was pretty muddy. Hi and welcome. Great trip - any day in a Texas Creek is a great day! On the markings, I agree that they are probably (though a bit hard to blow up to see) modern roots. A worm would have to backtrack along its burrow to create the branching pattern, but it's a normal root pattern. We've seen roots descend down 20-30 feet through cracks in the various layers. Make for very interesting finds, though. Love the tooth. Great color on it. Good luck, happy hunting and I look forward to seeing you around the forum. 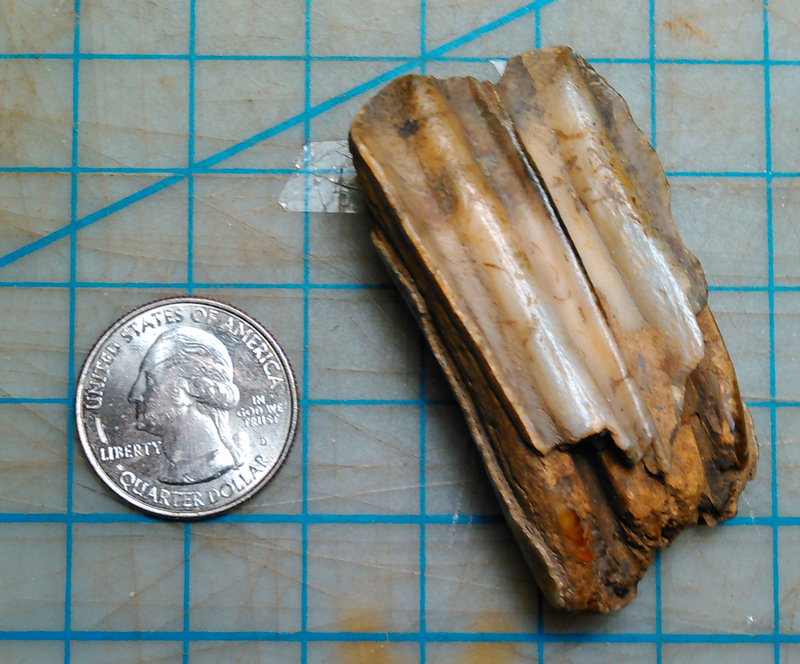 Cool bison tooth. I found one at Crystal Beach.